Despite the ruinous housing crisis just a few years ago, the federal government still keeps the suburban sprawl machine humming. About 85 percent of federal subsidies for housing flow to single family homes, according to a recent report from Smart Growth America, though only about 65 percent of Americans are homeowners and the majority of renters live in multi-family housing. The ultimate sprawl subsidy just might be the mortgage interest deduction. 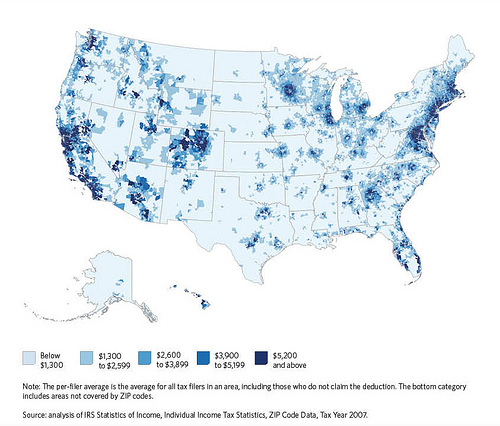 Not only is this baby completely regressive — the vast majority of subsidies flow to households with incomes greater than $200,000 — as you can see in the above map, this money tends to flow to areas where everyone is dependent on a car. Elsewhere on the Network today: Human Transit reports that Google Maps is planning some big improvements to its transit directions feature. Mobilizing the Region reports that New Jersey is the newest state to consider reducing speed limits to 20 miles per hour in residential areas. And Better Institutions comments on a unorthodox new plan to shore up the federal infrastructure bank. The mortgage interest deduction costs the federal government more than all rental subsidies combined. All that money promotes sprawl by encouraging people to buy more house, while transferring wealth to the upper tiers of the income ladder. Just How Regressive is America’s Federal Housing Policy?